The Nigerian Golden Eaglets have made Nigerians so proud for winning the FIFA Under 17 World Cup 2013 tournament which was just held in Abu Dhabi, the United Arab Emirate (UAE), thrashing out Mexico with 3-0 goals to nil this evening. 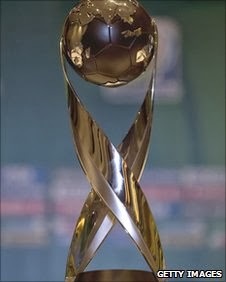 Interestingly, Nigeria Golden Eaglets have won and lifted this trophy three times previously in 1985, 1993, and 2007. Now it's 2013, We Won!...I'm Proudly Nigerian! Feeling real good. This year's Nigeria Golden Eaglets victory (3-0) has indeed placed Nigeria as the Champion of Champions of FIFA Under 17 World Cup tournaments ever, for winning and lifting it the fourth time ahead of their counterpart Brazil for winning and lifting same Cup three times. The Nigerian Coach Manu Garba and his boys are indeed, the Nigerian Heroes today making Nigeria so proud.